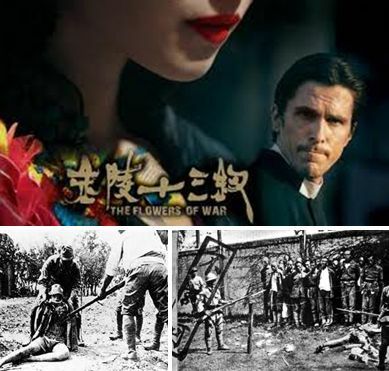 After the "Black Sun - The Nanking Massacre" that was released in 1995 on the notorious Nanking Massacre, "The Flowers of War" has broken new ground for China's movie industry: It's among the first domestically financed films to star a high-profile Hollywood actor (Christian Bale), and its reported budget of close to $100 million makes it the country's priciest production to date. But when it comes to storytelling, Zhang Yimou's 19th feature is decidedly backward-looking: A lavish period weepie set against the atrocities of the Nanking Massacre, "Flowers" abounds with well-worn movie archetypes and slathers on schmaltz. Based on Geling Yan's novel "13 Flowers of Nanjing," the story gathers an improbable collection of people — Bale's freelance American mortician, a group of convent schoolgirls and the women from a local brothel — in the nominal refuge of a Catholic cathedral as the capital falls to Japan's Imperial Army. Zhang marshals his creative team to deliver stunning cinematic sequences and period detail, particularly in Yohei Taneda's production design for the church and the character-defining costumes by William Chang Suk-Ping.